One of the things I like the most about these eyeshadows, is their packaging. You get 7 ml (0.2 fl.oz.) of product in a hygienic tube. You squeeze out the needed amount, then apply eyeshadow with fingers or brush. I used Stargazer corrector brush. 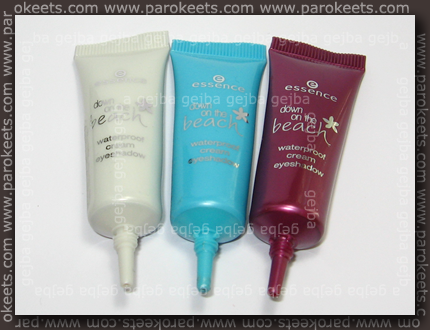 From left to right I applied: Pearly Shell, Viva Caribbean in Wild Orchid. Pearly Shell is the most compact shadow. Mineral shadows did not stick to it as well as on other eyeshadows, but they did stay on the longest and it was hardest shadow to remove with water from my arm. Viva Caribbean was hardest to apply – it’s kind a watery. I needed three layer to archive color you see in the swatches It’s great base for mineral eyeshadows as they stick to it … well if you don’t have oily lids, since it will probably crease on you. Wild Orchid was disappointment. I expected color similar to the one of the tube, but got one you see in the photos. Staying power wise it’s somewhere in between blue and white eyeshadow. 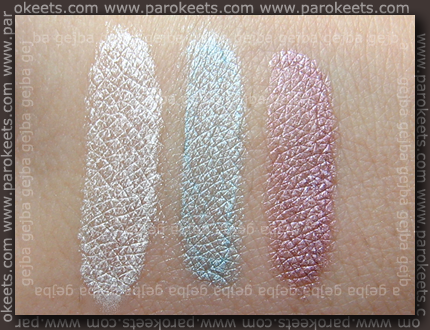 If we look at the shimmer present in eyeshadows – blue one has really fine one, while violet and white eyeshadows have larger simmer in them. I especial am not fond of combination – violet base and silver simmer. Price is around 2 EUR in Muller drugstores. 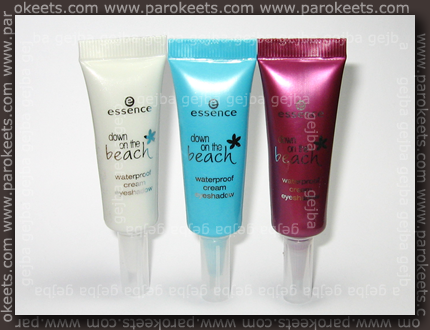 Polishes were not available in any drugstore that caries Essence brand. I hope they’ll be available in the future. 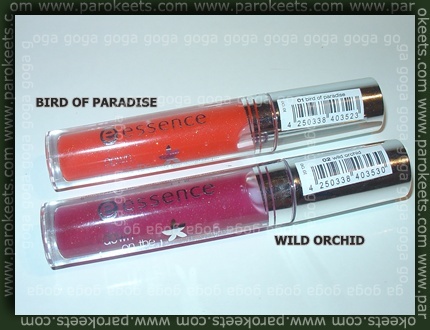 Goga has for you pictures and description for the glosses Bird of Paradise and Wild Orchid. Glosses are not very pigmented. They’re quite thick and give jelly look to your lips. 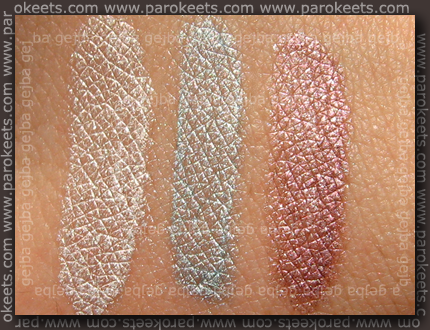 Shimmer is little larger than in other Essence glosses, but it’s not grity. Both of them have good staying power and are not sticky. I’m already thinking of buying few more … as a backup. 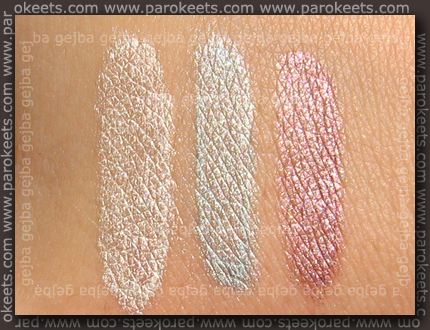 :shock: The glosses aren’t pigmented at all. What a shame. The colors look so pretty in the tube. I don’t care for the eye shadows. I don’t like watery shadows. It’s minerals or eyeshadow that’s compact for me. The others seem like they would be hard to control to get them on perfectly. :dizzy: Ah, groza no, nikjer ni več lakcev? Bila sem v AUT, kjer prav tako niso imeli lakcev. Ne v DMju, ne v Mullerju. :wassat: Kupila sem vijola in belo senčko. Do sedaj sem sprobala 2x vijola senčko. Na veki res ni skoraj nič opazna in je bolj na vodeni strani. Za bazo je srednje dobra. Mineralna senčila se je srednje oprimejo. Morda je sicer tokrat bil kriv čopič, ker nisem imela svojega Gosh-a ali blackyja pri roki. Senčila so sicer ostala na svojem mestu, a imam občutek, da mi čez čas začne oči dražiti. Nisem popolnoma prepričana… bo treba še več testiranj, da to ugotovim. Ah videla sem danes v KP..
Ostali sta le modra in vijolicna sencka. Pa se to ena vijola in dve modri, bah! Modra me ni prepricala, vijolicna tudi ne ker sem si zelela belo.. No se dobro da ni bilo, me pa mikajo lakci..
Glede na to da se v mullerju vecinoma drzijo datumov.. bodo mogoce ju3 lakci tam hm. razen lakcov (ki se jih itak nikjer ne dobi) mi nc ni posebej vsec..
Jaz sem pa vprašala, če so lakce dobili Muller v Kranju), pa pravi prodajalka da je bilo polno stojalo, a da so jih takoj punce pokupile. V tubicah izgledajo senčke zelo lepo. Glede lakov upam, da se jih bo dalo kje kupiti. O najdbi le-teh bom poročala.